Paul had been teaching the Faith in the main square for some time. Each time, James, a young Greek Jew, would attend his lectures. He was keen to learn the good news which Paul had to offer. In some sense, it was simple. It was a message of love and truth about a person called Jesus who spoke of a new kind of life. But James had many doubts and the nay-sayers among his family, friends and colleagues filled his heart with turmoil. He felt an obligation to consult his religious teacher, the leader of the synagogue, on such matters. The teacher’s responses were negative, but seemed soundly based on the one true Word of God, the Tanakh (The Torah, The History and Prophets) or Jewish Bible. After all, Israel was God’s chosen people and only through strict observance of the Law of Moses could one be saved. That was God’s word! And God’s word is inviolate. Do not many laws say that they are commandments “for ever”? The teachers also pointed out that Jesus had not fulfilled any of the prophecies of the Book. So, one day, James approached Paul. PAUL: How now, lad! Have you come to jeer at me, or to seek truth and life? Many there are that reject my teachings out right, without even listening. But know thou this, it is the duty of every one to seek the truth for himself and live with the consequences of it. We cannot attach ourselves to our interpretations, limited understandings and vain theologies. We must open our minds and let the Holy Spirit guide us. JAMES: Pray sir, I come but to seek wisdom of thee. Wouldst thou relieve me of my doubts? I have spoken to my rabbi and family and they give weighty proofs of the falsehood of this Yesous Khristos (Jesus Christ) or Yeshua Ha-Mashiakh of whom you speak. Yet, I feel that there must be more to this, more than they can see. PAUL: Indeed! Let them go! Why needest thou such teachers?! Seek the truth for thyself and thou wilt surely find it. As Jesus said: “Let them alone: they be blind leaders of the blind. And if the blind lead the blind, both shall fall into the ditch.” (Matthew 15:14) How often are religious teachers blind and ignorant hypocrites. I fear greatly that in some distant age, Christians, “so called”, might put on sheeps clothing and make themselves spiritual leaders. But instead of leading unto truth, they would deny the truth itself. Let us think for ourselves and know God’s Word! Leave alone such idle souls. JAMES: I see. But should we not obey our ministers? Alas, I am confused. But I see that they might be blind to the truth. Pray, help me to come closer to the truth! They have quoted many scriptures which say that the Messiah cannot have come already. JAMES: Isaiah said that the Messiah shall sit “on the throne of David” (Isaiah 9:7). My teachers ask, where is the throne?! This Jesus was a carpenter! PAUL: This is the nature of thy teachers’ blindness. They take the words literally, when the scripture speaks of the spirit. Prophecies should not be taken at face value. The throne of David symbolises sovereignty, kingship, dominion. What is sovereignty? JAMES: Kings have sovereignty. They do what they list. They command whatsoever they will. All bow before them in dread. PAUL: But they die, do they not? They live for but a moment and die. They have sovereignty, because they instill fear into their subjects. When they die, nothing remains but their names, their vast and worthless tombs, a footnote in some great history, stored on a dusty back shelf. How many kings sat upon the throne of David, and where are they now? Where is the splendour of Solomon? This kind of sovereignty is unworthy of the Messiah. There is another kind of sovereignty, real sovereignty. 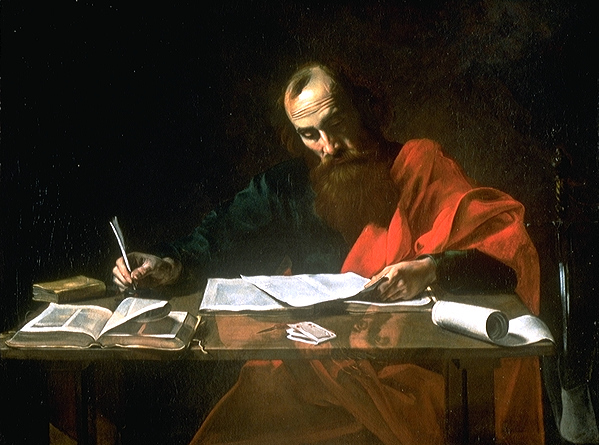 PAUL: Jesus was one man, alone and unaided, lowly in the eyes of men. Yet, how many of us there are who follow His every word, who embody His teachings, who die willingly for their faith in Him? Tell me, what king hath such authority? Christ’s words have animated this world, though the peoples thereof are all but unaware of it. Everywhere, one can see that a new spiritual spiringtime hath dawned. All but the blind in heart can see it. Christians are the life and leaven of the world. JAMES: Yes! Of course! I understand now. Jesus is not a physical sovereign, with a useless gold crown. His sovereignty is real sovereignty. But, it also says that He will descend from the clouds of heaven. Daniel says: “I saw in the night visions, and, behold, one like the Son of man came with the clouds of heaven…” (Daniel 7:13) How can this be? Jesus was born in a normal way, from a human mother. PAUL: Tell me, if thou lookest upon the clouds in the sky, canst thou see the sun? JAMES: No. The sun would be obstructed by the clouds. PAUL: Exactly! What are clouds? Clouds prevent us from seeing the sun. Jesus did come upon the clouds, for the clouds were His physical body. Many did not believe in Him because they only saw an obscure Galilean. No one had heard of Him before. How could He be the Messiah? Yet, so He was, and is! And He shall return from heaven once more, upon the clouds, even as He came the first time! JAMES: Dost thou mean that He shall fly down to the earth at the last day? PAUL: Hast thou been listening to my words? He shall descend from heaven upon the clouds, even as He did the first time. JAMES: I do not understand. PAUL: Jesus said: “For I came down from heaven, not to do Mine own will, but the will of Him that sent Me.” (John 6:38) He came down from heaven the first time, and shall return likewise. JAMES: So thou meanest that He will be born of a natural mother once more, but that this is also descent from heaven? I think I understand. Heaven must also be symbolic, is it not? PAUL: Jesus said: “And no man hath ascended up to heaven, but he that came down from heaven, even the Son of man which is in heaven.” (John 3:12) That is, Jesus said that He came from heaven, will ascend up unto it, and is in it, yet he was standing on the earth, talking as a man. He speaketh not of the heaven above, but of a spiritual heaven. Ascent and descent have no meaning in spiritual terms. Christ descended from heaven, ascended up unto heaven and will descend again from heaven, but only a credulous child would believe that this means a literal man floating on visible clouds! Understand the meaning of the words, and be not blind. Imagining such phantasies is true blindness! JAMES: But I have heard thee say that Jesus was resurrected and that we shall be also? Did thou not say so? Thou didst say that the BODY of Christ was lifted up. PAUL: Indeed. Our Faith depends upon the resurrection. “If Christ be not risen, then is our preaching vain” (1 Corinthians 15:14). I have seen the risen Christ. The risen Christ is with us at all times. All may see Him, for we are all His flesh and blood and bones that were lifted up. When Jesus was crucified His mortal body died, and so did His Church, which is His true body. But on the third day it was lifted up. THE CHURCH is His body which was lifted up on the third day. “For we are members of his body, of his flesh, and of his bones.” (Ephesians 5:29) “For as the body is one, and hath many members, and all the members of that one body, being many, are one body: so also is Christ. For by one Spirit are we all baptized into one body, whether we be Jews or Gentiles, whether we be bond or free; and have been all made to drink into one Spirit. For the body is not one member, but many.” (1 Corinthians 12:12-14) CHRIST lives for we are His body, we are His flesh and bones, so long as we keep His teachings and follow His commands unto us. JAMES: I understand, I think! So, Christ’s body is His church. On the third day the Church was revived. Christ had risen! Christ is risen! PAUL: Yes! Truly. The Pharisees say it did not happen. That is because they are blind. They think that we speak of a physical body. The physical body of Jesus is dead. But Christ cannot die! Christ is not a man, but the eternal Logos, the Word that existed before the world was. JAMES: But I understand not. Is Jesus God or man, and is he THE Christ? PAUL: The sun is a flaming ball of fire, suspended beyond the ken and reach of man. Can anyone touch it? JAMES: Nay! And if one stares into it, one is blinded. PAUL: How can we bring this light down to us, so that we might more easily view and feel this great heavenly body? JAMES: We could take a mirror perhaps. JAMES: Yes, one which was pure and clean. We would be able to see the fullness of the sun. JAMES: Yes, thou canst well do so. PAUL: And if I say: “This is a mirror”, am I also correct? PAUL: Jesus was like unto a perfect and immaculate mirror. He was a pre-existent being, a pure soul without sin. If we say He is man or God, we speak the truth, so long as we do not say, God forbid, that He is the essence of God Himself. To say that He and God are of one substance is to the insult God and naysay our own faith. What an ignorant and illogical notion. Are the mirror and the sun the same? Nay! JAMES: This makes so much sense! JAMES: So, CHRIST was not crucified or killed. It was only the body, the mortal human body, that was killed. They had only His semblance, not His reality. PAUL: Yes, thou are beginning to understand well. JAMES: And when He returns, He will born of mortal parents and His physical body will be the “clouds of heaven”. JAMES: But how will it be the same Christ? PAUL: Tell me, if I say that today’s sun is ‘the sun of today’ and give it a name, and call that which came yesterday ‘the sun of yesterday’, am I right in doing so? JAMES: Of course, for one came yesterday and the other today. PAUL: If I say that they are one and the same sun, am I not also right in doing so? For they shine in the same manner. But now summer hastens and the sun of today is of even greater warmth than the previous. The sun is giving greater heat and warmth each time. JAMES: I see! So the next time that God sends His Mirror, He shall be the same Christ! And His teachings will be an even greater revelation of the truth. PAUL: Even so! Christ promised that He would return in the Glory of the Father. The Glory of God will not come in our time, but His coming will fulfill all that came before it. He shall be the “Wonderful, Counsellor, The mighty God, The everlasting Father, The Prince of Peace” (Isaiah 9:6). He will be persecuted and travel from land to land. His followers shall be “called by a new name, which the mouth of the LORD shall name” (Isaiah 62:2) Do not expect them to be called Christians! It will be a new name, which thou shalt not have heard of before. “In that day also he shall come even to thee from Assyria, and from the fortified cities, and from the fortress even to the river, and from sea to sea, and from mountain to mountain.” (Micah 7:12) Understand thou this? JAMES: I think I do. This gives a list of places from which He will be exiled by those that persecute Him. Perhaps He will come from Persia in the east and be exiled from thence to many lands. But it is also promised that He shall come unto Israel, is it not? JAMES: The Glory of God will come to Carmel! Praise be the Lord. I now know not only who is my true Lord, Jesus Christ, but also that He shall come again, with a new name and fulfill all that is past. PAUL: Many will not recognise the Glory of God. His name may be in a foreign tongue, perhaps, and men will think it strange. His Faith will spread, and its teachings will come one by one to be adopted by society. In time, a new world order shall be established and all the world will be one country and one land. All will be united and all will adopt the new faith, whatever it shall be called. This is the beginning of a new world. Each time Christ comes He ends an old world, and rolls out another. But the Glory of God shall bring the Kingdom of God on earth. Let us pray for His advent and hope that mankind will embrace His message. JAMES: I thank thee greatly for these deep and spiritual teachings. There is another thing that I wonder, and hope that thou mightest expain unto me. I know that thou speakest of the Messiah, but what of Elijah? It says in Malachi (4:5): “Behold, I will send you Elijah the prophet before the coming of the great and dreadful day of the LORD.” Should he not have come as well? And would his return also be symbolic, like the return of Jesus that is to come? Also, does this mean that “the great and dreadful day of the LORD” hath come? JAMES: So he was not Elijah? JAMES: Now I am confused! So is he or isn’t he, and hath the great and dreadful day of the Lord come or not? PAUL: Let us take the similitude of a flower of yesteryear. It bloomed in all its glorious beauty and aroma. Now I come again unto the same field in which it grew and behold a flower like unto it. What shall I remark? Behold, the flower of yesteryear hath returned!!! For it is not the individual, that Jesus Christ speaketh of, but the qualities. JAMES: I think I understand. When John replied, he was talking about his individuality. Of course, the individual called Elijah will never return physically, as thou hast made quite clear on the subject of resurrection. But when Jesus was asked, He spoke of the qualities and virtues of the individual. So, whenever Jesus speaketh of return, he meaneth the return of the quality, not the individual. PAUL: Exactly! The Glory of God who is to come will be the return of the same qualities and virtues as Jesus and will manifest the same Christ, even though He will have a new individuality, a new rational soul. JAMES: But hath the great and dreadful day of the Lord already come, since Elijah is come. JAMES: So Abraham, Moses, Jesus, are all Manifestations of the same eternal Logos, the same Christ? They are all the return of the previous with an even greater portion of truth? PAUL: Even so! And there are many more Manifestations of God. Christ hath come to every land and people in the world at one point or another. I have heard that the Persians have a Manifestation called ZOROASTER. He too, as I understand stand it, is Christ. There are not many Christs, but one Christ, which is manifested and returns in every age. When the Glory of God cometh, however, it will be the day when the Kingdom of God will finally be established. JAMES: I see. So, they are all one and the same. PAUL: Yes, each is the return of all the previous. Each of them could say: “I am only a prophet” or “I am God” or “I am the first” or “I am the last” for they are all Manifestations of the first of the last. If they were all to say “I am the seal of the prophets” or the “last of the prophets”, that would be true. Or if they were all to say, “I am the first of the prophets”, the “first Adam”, that would also be true. There is no difference between the first and the last in the sight of God. There will never be a first Manifestation of God or a last Manifestation of God, but they are all the first and the last. JAMES: This is a difficult teaching for the world to bear. JAMES: But the Pharisees do believe in Moses and in what He wrote! PAUL: Ah, so they claim. But they only take the outward, literal meaning and understand not the spirit within. Moses and Jesus are one and the same. If they truly recognised Christ Moses and his teachings, they would see that the same sun is manifest in Christ Jesus. JAMES: So, in the future, when the Glory of God cometh and manifesteth Himself, will those Christians that have rejected Him, have rejected Jesus also? PAUL: Yes. It will not be possible to believe in Jesus Christ and at the same time reject the Glory of God who is to come. They are one and the same. If thou shouldst reject, one, thou are simultaneously rejecting the other. Thou must recognise both! or neither! JAMES: I fear that a great many Christians will stumble at this when the last day cometh, and may heed the counsels of blind ministers and literal readings of the Gospel, and they may fail to recognise the Glory of God when He manifesteth Himself. PAUL: I fear this also. Many Christians will take the words of Christ at their face value and will repeat them over and over again, using them as a shield or a veil between themselves and the truth. They may take this verse, for example: “I am the way, the truth, and the life: no man cometh unto the Father, but by me.” (John 14:5) But is not Jesus the Mouthpiece of God? Is it the human person who walked on this earth some decades ago, or the eternal Logos who is speaking? They will take such verses and rap them over their eyes so that they cannot see. If they think that this means that Jesus is the only Manifesation of God, then they are indeed blind. And they will take this verse: “For God so loved the world, that he gave his only begotten Son, that whosoever believeth in him should not perish, but have everlasting life.” (John 3:16) But Christ also said: “But as many as received him, to them gave he power to become the sons of God, even to them that believe on his name: Which were born, not of blood, nor of the will of the flesh, nor of the will of man, but of God.” (John 1:12-13) How can God have one Son and many Sons? Obviously, God speaketh not of physical sons, but of spiritual sons. The “only begotten Son” meaneth the eternal Logos (Word), not the individual human called Jesus. JAMES: It is sad that they will use the Word of God to prevent themselves from recognising the Living Word, that is, the Manifestation of God who is yet to come. PAUL: They may wrap theologies around my words and make up beliefs for themeselves. I can only imagine what they might make of what I wrote to the Corinthians: “For as in Adam all die, even so in Christ shall all be made alive.” (1 Corinthians 15:22) Perhaps they may come to think that the story of Adam and Eve is literally true and that by eating the fruit of a tree, sin was brought into the world, and that by Christ’s death, sin was no more. What a strange idea! Adam here symbolises the physical nature of man, which is spiritually dead. It is only through the eternal Christ that all are made alive. The death of Jesus brought a great redemption into this world and “the blood of Jesus Christ his Son cleanseth us from all sin” (1 John 1:7). But so did the sacrifices of the Law of Moses, or the sacrifice of Abraham’s eldest son. What of Stephen? I saw his death. His blood also watered this earth and will water the tree of God’s holy faith. I do not doubt but that mankind will yet again try to shed the blood of Christ, when He returns. There is not one and only redemptive sacrifice for mankind, nor do we inherit the sin of a symbolic forefather, who ate the fruit of a tree in an allegorical story!!! JAMES: In the meantime, I am ready to accept Jesus into my heart. Is this all that I need to be saved? PAUL: Thou must do good works also. Faith and works must go hand in hand. One is not acceptable without the other. “Ye see then how that by works a man is justified, and not by faith only…For as the body without the spirit is dead, so faith without works is dead also.” (James 2:24, 2:26) If someone believes He can be saved by just saying “I believe in Jesus Christ and accept Him into my heart”, then He is not a Christian. Jesus says, clearly, “Not every one that saith unto me, Lord, Lord, shall enter into the kingdom of heaven; but he that doeth the will of my Father which is in heaven.” (Matthew 7:21) THIS is the truth! Trust the words of Jesus Christ, not some foolish teacher. JAMES: I shall try to learn to follow the Christian teachings and believe in Christ through all my days. I hope and long also for the coming of the Glory of God. PAUL: Then thou art a true Christian. Many Christians do not understand these things, for not all have the strength to take these teachings into their hearts. Some are there which see only the outward words. I fear lest they reject the returned Christ because of some useless literal interpretation. Trust in the following words as thy criteria: “Ye shall know them by their fruits. Do men gather grapes of thorns, or figs of thistles? Even so every good tree bringeth forth good fruit; but a corrupt tree bringeth forth evil fruit. A good tree cannot bring forth evil fruit, neither can a corrupt tree bring forth good fruit.” (Matthew 7:16-18) Why be afraid!!!? The Glory of God will show forth good fruits! So accept him, O Christians who are to come, accept the Glory of God when ye hear of Him!!! JAMES: May God open all our hearts to the truth! TO LEARN MORE ABOUT THE BAHÁ’U’LLÁH, WHO IS THE GLORY OF GOD, CHRIST RETURNEDIN THE GLORY OF THE FATHER, SEE: http://bahai.org/ or http://www.bahaullah.com/ HE CAME WAS EXILED FROM PERSIA TO WHAT USED TO BE ASSYRIA, AND FROM PLACE TO PLACE, EXACTLY AS DESCRIBED IN THE BIBLE. HE CAME TO CARMEL AND THERE PITCHED HIS TENT AND SANCTIFIED THE WORLD CENTRE OF THE FAITH. LEARN ABOUT THE “NEW NAME” WHICH GOD HATH GIVEN TO HIS FOLLOWERS IN THIS DAY. THEY ARE NOW CALLED BAHÁ’ ÍS. FOLLOW THE APOSTLE PAUL’S ADVICE AND LISTEN TO THE TRUTH. GOD BLESS YOU ALL! If you are an open-minded Christian seeker of the truth, I strongly urge you to investigate Bahá’u’lláh’s life and teachings, especially through reading His Writings. Please read the following quotes from The Most Holy Tablet (a.k.a. Tablet to the Christians), which specifically addresses you. God is speaking to Christians through this text. God is summoning you to His Manifestation in this day. He is the Promised One of all religions.